Experience one of the most scenic sunsets in our Mecca Hills Wilderness where time stops, and you savor each moment; and let yourself wander as the sun sets over our mountains and the stars light up our valley and our spirits. Enjoy the camaraderie around a roaring bonfire while sharing a potluck dinner. 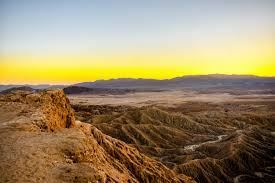 We will take a short hike to an overlook viewing the sunset on the Salton Sea and surrounding mountains. Return to a bonfire at the trail head parking area for potluck and large campfire. Or you can stay at the campfire and enjoy the sunset. Meet 3:30 pm at PetsMart at Ramon/Crossley to carpool and caravan to trailhead. Or meet 4:30 pm at Sheep Hole Oasis trail head Box Canyon Road: Map and directions. There will be a sigh and light at the trailhead turnout. Drive 42 miles (50 minutes) to Mecca Hills to Sheep Hole Oasis trailhead along Box Canyon Road. 5:00 pm Hike (.5 mile out and back) to overlook for 5:35 PM sunset. 6:00 pm Bonfire and potluck dinner at the trailhead parking area. Bring something to eat and share and your favorite beverage, camp chair and flashlight. Bring potluck dishes "ready to serve" including any needed serving utensils. No facilities to keep a dish warm. Ice chest available to keep dish cool. Water, sodas, hot coffee, tea, paper plates, utensils, firewood provided. Pets are welcome, but please keep your pets under control. The weather may be cool so dress accordingly with layers. No cell services. Plenty of parking at the trailhead. The soil/sand is compacted and easy access. Carpooling is encouraged and may be available if offered by driver. You are responsible for arranging you own transportation or ride share. Weather Policy: Inclement weather cancels. The Mecca Hills Wilderness is bordered by the Orocopia Mountains Wilderness to the east. Thanks to the restless San Andreas Fault, the geologic formations of Mecca Hills Wilderness are among the most unusual sites of their kind in the world. Entire regions are exposed layers of eroded rock, some over 600 million years old, and are a source of valuable information to scientists about the effects of tremors on the earth's crust. The area is a badlands labyrinth, a natural maze of small, narrow, steep canyons. Colorful Painted Canyon runs in a general north-south path through the middle of the Wilderness. Sandy washes sprinkled with ironwood, smoke trees, and paloverde divide the area, while ocotillo squat on gentler slopes and the tops of mesas. Bighorn sheep occasionally cross over from the Orocopia Mountains on the east, where they find more water. You may see spotted bats, desert tortoises, and prairie falcons.